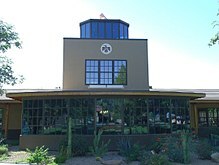 Public education in the Phoenix area is provided by 33 school districts. There are 21 elementary school districts, which contain over 215 elementary schools, and they are paired with 4 high school districts, which have 31 high schools serving Phoenix. Three of the high school districts (Glendale Union, Tempe Union and Tolleson Union) only partially serve Phoenix. 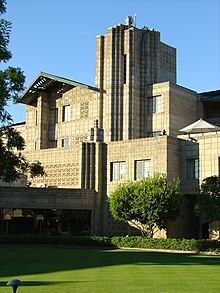 With over 27,000 students, and spread over 220 square miles, The Phoenix Union High School District is one of the largest high school districts in the country, containing 16 schools and nearly 3,000 employees. In addition, there are 4 unified districts, which cover grades K-12, which add an additional 58 elementary schools and 4 high schools to Phoenix's educational system. 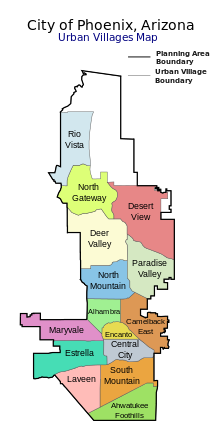 Of those four, only the Paradise Valley district completely serves Phoenix. 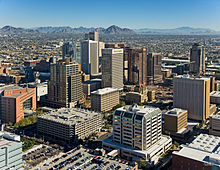 Phoenix is also served by an expanding number of charter schools, with well over 100 operating in the city. ^ Villarreal, Phil (2018-02-14). "Arizona turns 106 Wednesday". KNXV. Retrieved 2018-02-14. ^ a b Kottek, M.; Grieser, J.; Beck, C.; Rudolf, B.; Rubel, F. (2006). "World Map of Köppen−Geiger Climate Classification" (PDF). Climate Change & Infectious Diseases Group, Institute for Veterinary Public Health. University of Veterinary Medicine Vienna. Retrieved 30 January 2018. ^ a b Peel, M. C.; Finlayson, B. L.; McMahon, T. A. (11 October 2007). "Updated world map of the Köppen-Geiger climate classification". Hydrology and Earth System Sciences. 11 (5): 1633–1644. doi:10.5194/hess-11-1633-2007. 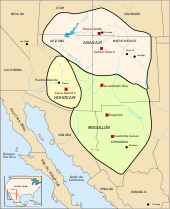 ^ "Maricopa Tribe". 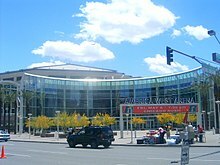 2011-07-09. Retrieved February 17, 2014. ^ "Arizona Centennial". The Arizona Republic/AZCentral.com. Retrieved February 27, 2014. (Subscription required (help)). 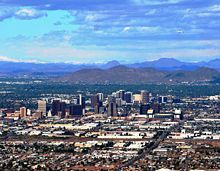 ^ "Phoenix: America's Desert Metropolis | Smart Cities Dive". www.smartcitiesdive.com. Retrieved 2019-03-08. 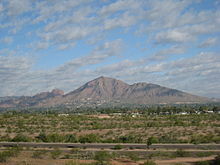 ^ "Phoenix, Arizona, USA - Monthly weather forecast and Climate data". Weather Atlas. Retrieved 5 February 2019. 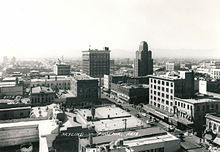 ^ "Art Detour at 30: 5 pioneers who built the downtown Phoenix studio scene". 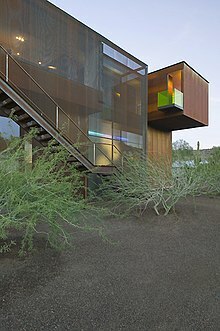 azcentral. Retrieved 2019-02-28. 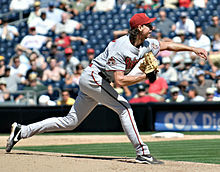 ^ Moore, Greg. "New Arizona football team is called the Hotshots: Disrespectful or paying homage?". azcentral. Retrieved 16 October 2018. ^ "Annual Report" (PDF). Maricopa County Sheriff’s Office. 31 December 2017. p. 42. Retrieved 26 December 2018.